In the Delft-FEWS Water quality configuration course more advanced features of Delft-FEWS configuration will be explained based on several hands-on exercises and short lectures by Delft-FEWS experts of Deltares. It will continue on how to address water quality data (chemical-, nutrient-, and hydro-biological data) in the Delft-FEWS database, where the Basic configuration course of Delft-FEWS stopped. The second half of the course will show how to integrate hydrological or water quality models in a Delft-FEWS application. Delft-FEWS is a software package developed by Deltares to provide an easy and modular way of setting up operational forecasting systems. Due to the modular approach Delft-FEWS allows you to plug in a wide range of data sources, models and data types. This can all be configured in the Delft-FEWS configuration files. Delft-FEWS was originally intended for hydrologists and used for Flood Early Warning. Currently Delft-FEWS is used in over 40 countries over the whole world and has expanded its areas of applicability towards droughts, hydropower, coastal systems, water quality, data conversion, shipping, dredging and long term scenario studies. After taking this course the participants have a good understanding of the structure of the Delft-FEWS configuration. They are able to implement their own water quality data feeds into Delft-FEWS, set up a basic Water Quality Information System and know how to expand this system in the future. 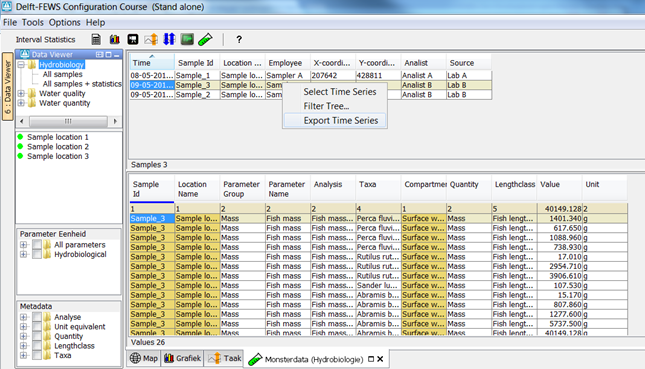 How to export sample data. Water quality, Ecology, Hydrology, Monitoring data. The registration fee for this course is € 565, – excluding VAT. This course was part of the Delft Software Days – Edition 2018 (DSD-INT).